CFTC held its annual “Donor Appreciation Evening” on June 12, 2012 at the beautiful Berkeley Church on Queen Street East in Toronto. An enthusiastic crowd of more than 150 shopped the International Artisan Market and danced to the beat of the Alpha Rhythm Roots drummers from West Africa, among other highlights. Representatives from Toronto District School Board's Enhanced Language Training Program with CFTC ED Debra Kerby. The 2012 Volunteer of the Year Award, which honours the contributions of outstanding volunteers who have shown an exceptional commitment to CFTC’s mission, vision and values, went to The Toronto District School Board, Enhanced Language Training Program. TDSB has provided Canadian Feed The Children with many exceptional volunteers who have supported us with activities as varied as accounting to envelope stuffing to preparing receipts over the past three years. Konstantina Pantoulias and Salimah Somji accepted on behalf of TDSB, speaking compellingly of the strong match between the two organization’s vision and mission to provide a bridge between those who need help and those who can provide that help. Madsen Gachette, CFTC country rep in Haiti, and a FICOSA worker celebrate at a critical milestone in the Léogâne irrigation project. 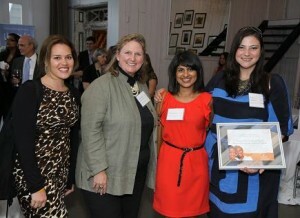 The 2012 Community Partner Award went to a local Haitian company, FICOSA (Firme de Construction et de Service Agricole). Debra Kerby, executive director and Madsen Gachette, country representative for Haiti who accepted on FICOSA’s behalf, both spoke about FICOSA’s professionalism, skill and experience as keys to the success of both the House of Hope girls’ dormitory reconstruction and the CIDA-funded irrigation project in Léogâne, Haiti – the epicenter of the January 2010 earthquake. Awarded to individuals or organizations that demonstrate an outstanding commitment to reducing the impact of poverty on children through their work with CFTC, FICOSA earned the community partner award by exemplifying and matching CFTC’s strong community development approach. In the case of the House of Hope project, they recruited local contractors, tradespeople and labour and provided not just infrastructure so desperately needed by 100 little girls, but a boost to the economy and the spirits of all involved in the project. At Léogâne, they confronted late and extended rains and even physical danger, yet met the project’s deadline and budget with exceptional attention to detail and quality in their work. 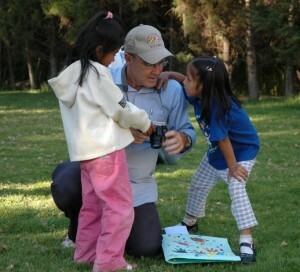 Dr. Mark Wise: compassion in action (Bolivia, 2007). The emotional peak of the evening was reached during the presentation of the 2012 Champions Award to Dr. Mark Wise. Rob King, chair of the CFTC board, took the opportunity to thank his friend and mentor who has been involved with CFTC since 2000. Mark joined the CFTC board in 2004, and in 2007, upped his commitment yet again by becoming board chair. Although he stepped down from volunteering his time to the board in 2011, he has remained a great supporter to the organization, spreading the word about CFTC in just about every area of his life. He’s written many articles published in local media and online; hosts the annual “Chocolate Milk Open,” a golf game with his friends that supports CFTC work; and promotes CFTC to patients in his travel clinic, prompting them to turn their travel plans into fundraising opportunities. A short video captured the breadth of Mark’s involvement past and present, and showed Mark’s compassion for children in action – leaving many in the audience with a lump in their throat and on their feet to thank Mark for his warmth, his enthusiasm, and his generosity of spirit.